At the end of 2013, we announced that Anobium would be going to the cosmological backburner for a time while our execs focused on honing their other skills (alchemy, aerobics, aerodynamics, etc.). This upcoming summer, we’re putting Anobium back over high heat and we’re not watering it down. Bona fide 200 Proof. 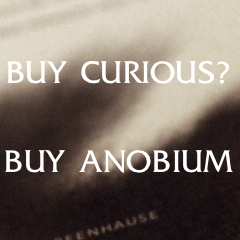 In the past, we’ve called Anobium a fringe media and literary publisher. We’ve called Anobium insectile, psychotropic, and other contrived adjectives. But our time away allowed us to reflect, and hopefully, to grow/ferment. Now with the heat coming back up, our goal for 2015 will be to refine Anobium’s tripartite function as a fringe arts and media aggregator, literary producer, and creative community resource. Today, Anobium becomes your independent literary organization promoting outsider media, creative exploration, and intellectual experimentation in and beyond the digital community. We value ingenuity, iconoclasm, and interdependence. No writer or artist is an island, but a node in a network that pulsates the present. Our reimagined approach will still be fundamentally literary, though we are expanding this term to include more than just books and long multi-page essays with ads in the sidebar. Literature isn’t just words. Literature is the world. To understand the world, you need to read and write it. You can do that just as well with a paintbrush as you can with a camera or a pen, though all of these things are meaningless without dirty hands, sunburns, and bloody eardrums. Tell us about it with your writing, videos, visual art, and vicissitudes. As for the internal changes, “Mary J. Levine” will be stepping down from her post as editor-in-chief to pursue her dreams on the streets of LA, though she’ll still swinb by to consult. Co-founder Benjamin van Loon will be taking over as leader to guide our website, social media, physical productions, and future collaborative efforts. Because Benjamin is based in Chicago, Anobium will continue to call Chicago its home. We’ll also be building a new, robust team of editors, contributors, and free agents. If you’re interested in joining our cabal, send us a message and let us know what you can contribute. Video production, website management, unique content, journalistic explorations, interviews, collaborative ideas, occult knowledge, obscure VHS transfers, limited-release EPs, money. We’re open to everything. Aside from rarifying our web content in 2015, we also have plans to release at least one physical product (a book, a record, or something else)—with accompanying digital release. Also in the past, we’ve also had two collaborative writing projects. This year, we’d like to do something similar. Stay tuned for opportunities and announcements. Meanwhile, thanks to our old readers for your patience and our new readers for your optimism. It’s gonna be a hella good year.